I’ve watched Jake Tapper as far back as his ABC days before he was hired by CNN. In those early days, it seemed like he used to smile a lot more. After reading The Hellfire Club, he should be smiling a whole lot more. 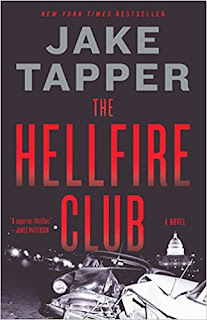 Tapper’s debut novel had me consulting with various historical resources to keep abreast of the various pieces of this historical romp through 1950s Washington, DC. Charlie Marder is a freshman Congressman, appointed to the seat through family connections after the death of his predecessor. He is an unlikely politician, standing firm to his morals in a town that is far too complacent with making backroom deals that often fracture those morals. His pregnant wife, Margaret, has a career of her own and not afraid to to keep working towards her own goals. In the 1950s, this does not endear Marder to his congressional colleagues any more than his firm values do. The hidden power that pervades through the nation’s capital makes its presence known right from the start when Marder regains consciousness at the wheel of a wrecked car with a dead woman nearby. And he has no memory of how he got there. When a friend helps him get away and the accident disappears, Marder eventually realizes he’s been unwittingly drawn into a conspiracy that could reach even the highest levels of government. In the midst of the fictional life of the Marders, Tapper has woven real, historic events and people. Joseph McCarthy rears his ugly head as he tears the country apart with his ill-gotten crusade. John F. Kennedy makes an appearance, as does Lyndon Johnson. Also taking a predominate part in the narrative was the 1954 Capitol shooting. I had to look up the history of that event. For the most part, Tapper kept with the historical narrative, adding only one important aspect to further the story for Marder. 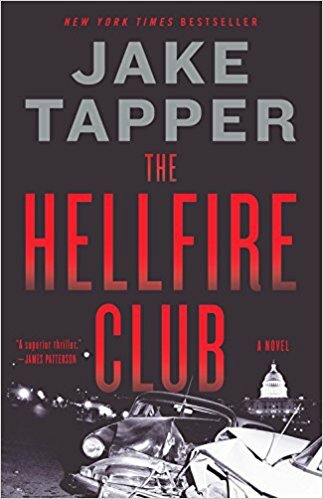 The Hellfire Club is a fast-paced political thriller set in a time period of American history that a lot of change was coming with a lot of speed. Tapper knows the ins and outs of the political world that is Washington, DC. Obviously he has done his research as he brought the past to life with each page. And really, how much has changed over the course of 65 years? Perhaps that glimpse into the past sheds a little light on events of modern day. Despite the fact that Charlie Marder is the main character, I think his wife is the more compelling of the two. Her story strikes me with more realism than his. However, it was good to see that Charlie held strong to his principles throughout every obstacle that is thrown his way. The addition of historical figures was a nice touch, too. It added to the realism of the story. I thoroughly enjoyed this book. There were a couple of places where he fell into cliche and stereotype, but overall, it was a great book. I like it when books make me read other books about what happened in the one I was reading. I ended up reading quite a bit about the Capitol shooting. That, for me, makes The Hellfire Club a great book to read. This book was Jake Tapper’s debut novel. I sincerely hope he writes more, especially with his unique insight into the political atmosphere of Washington. It adds additional realism and excitement. I will surely be awaiting his next adventure. Craig Bacon is sure he’d enjoy sitting down for a beer and wings with Jake Tapper so they can discuss history and politics. Next time you’re in Buffalo, Jake?